Just like pretty much all the other sewing tools, there are quite some options when it comes to the marking tools as well. But again, just like the other sewing tools, they are all not created equal. And while choosing the right marking tool may not seem like a big deal, ending up with a wrong one can make life difficult for you. This is especially true when working on sewing projects that demand a high level of accuracy, regardless of whether they are hand sewing projects or require the use of a sewing machine. So it makes sense to learn what the different marking tools have to offer and choose the right one for your needs. It’s one of the more unique types of marking tools, thanks to coming with two ends. One of the ends is for water-soluble ink, while the other is for disappearing ink. Using the water-soluble tip means that the markings you create will stay until you wash the fabric. On the other hand, the disappearing tip creates a kind of markings that would go away on their own, without you having to do anything. The biggest advantage of the water-soluble markings is that you will be able to have them for the entire duration of your sewing project, but with the downside being that you will have to wash the fabric to get rid of them. And while the disappearing tip markings won’t require the washing of the fabric, they may end up disappearing well before your project is completed. You would want to stick to the disappearing markings for the fabrics that are prone to water damage, though. At the same time, however, keep in mind that you need to wait until the disappearing markings have completely went away before you wash them, or they may turn into permanent marks as they come into contact with the detergent. Another important tip I’d like to give here is that the disappearing ink marker may not turn out to be a great choice when you’re working on something special like an heirloom quilt project, as the markings it creates tend to deteriorate the quality of the fabrics over time. 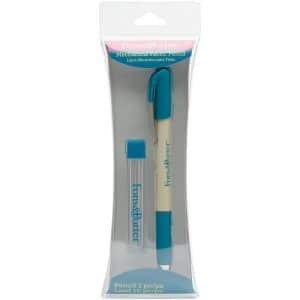 We like the Dritz Disappearing Ink Marking Pen. You can grab it cheap on Amazon.com. A fabric pencil is a water-soluble marking tool. One of the reasons I do not like it a lot is that the lines it draws are often not very easily visible, but then there’s the unique advantage that you can sharpen them for a fresh, brighter marking. Furthermore, unlike some of the other types of marking tools, they don’t dry out, which makes them more economical if you prefer to use the same marking tool for a long period of time. Also, their apparent downside can turn out to be advantageous for some projects, especially when working on darker fabrics. This is because their light colors show much better on many fabrics. My advice here would be to only use a fabric pencil as long as you don’t need to press it hard on the fabric to create a marking, as doing so may end up damaging your project in some way. If it’s not creating the markings easily, you need to get a new one. We like the Dritz 7757 Fons and Porter Mechanical Fabric Pencil. You can grab it here on Amazon.com. This marking tool usually comes in a flat rectangular or triangular shape. It’s easy to rub off of your fabric and hence it can be much less of a hassle than the other marking tools we discussed above. That doesn’t mean all is perfect with it, though. This is because it can often be messier than the other tools, and also difficult to see when being used on light fabrics. However, the tailor’s chalk also comes in a pencil form which most people would find much more convenient to use. For using a tailor’s chalk effectively, you would want to keep it sharp, as that would help you create thin lines (and hence less mess) that would pave the way for more accurate results. Something to be careful about when using tailor’s chalks for marking is that some of them contain wax. These are obviously not the ones you would want to use as they can leave a waxy residue. You can test the chalk for wax by using it on a scrap fabric and then ironing the fabric. If you see a waxy residue, go for something else. 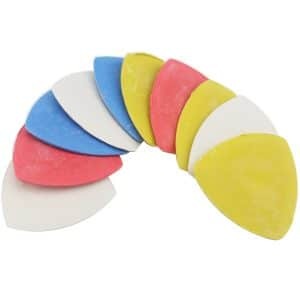 We like the Ogrmar 10-Piece Professional Tailor’s Chalk. Using a tracing wheel allows you to create the kind of indentations that would act as markings for you. They will be temporary though, so you don’t need to worry about they refusing to go away once the project is completed. This marking tool requires a tracing paper to be placed between your fabric and the patterns, and then use the tracing wheel to create the markings using the patterns. In other words, the tracing paper works like a carbon paper here – or a cheaper cutting mat. Something that will help you use this marking tool effectively is going with a color that’s easily visible, but not so dark that it ends up showing through on the other side. Similarly, always make sure that you only create the markings on the back or wrong side of your project, and never on the front, right side. We like the Dritz Start-To-Sew Kit. You would find this marking tool to be more like a crayon. However, it’s wax, so you run the risk of staining your fabric when using it. Theoretically speaking, you may not end up with a stained fabric as the wax tends to come off when ironed, but it may not always turn out to be the case. That said, the tailor’s wax is still the most effective marking tool when it comes to some of the thickest or heaviest fabrics out there. But again, don’t forget that it can sometimes leave a kind of residue that would refuse to go away, just like how something like grease does, so limit its use to the type of fabrics on which the other marking tools turn out to be ineffective. 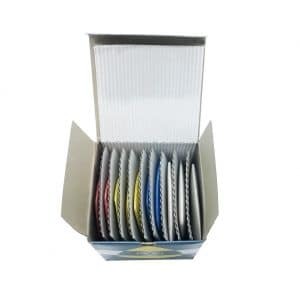 We like MAGGIFT sewing chalk wax. 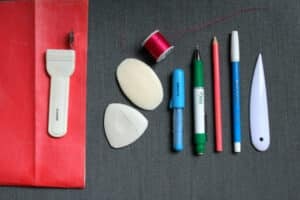 While the ones I reviewed for you are the best, most common marking tools used for sewing projects, there are some others as well. They usually include school chalks, ballpoint pens, permanent markets and even soap. However, as they are not as effective as the ones we discussed, I wouldn’t talk about them in detail and make things confusing for you. 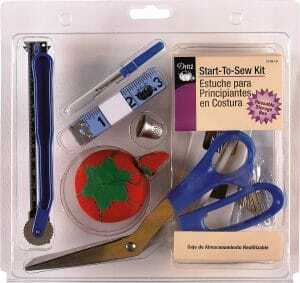 Head back to Chapter 1: The 7 Sewing Essentials for Beginners!